I love soft scrambled eggs. I love tamagoyaki. I love the mutant hybrid of the two: soft scrambled tamagoyaki eggs seasoned with sugar, soy, and mirin. Served on a fluffy bed of rice with nori. I love tamagoyaki with a passion. 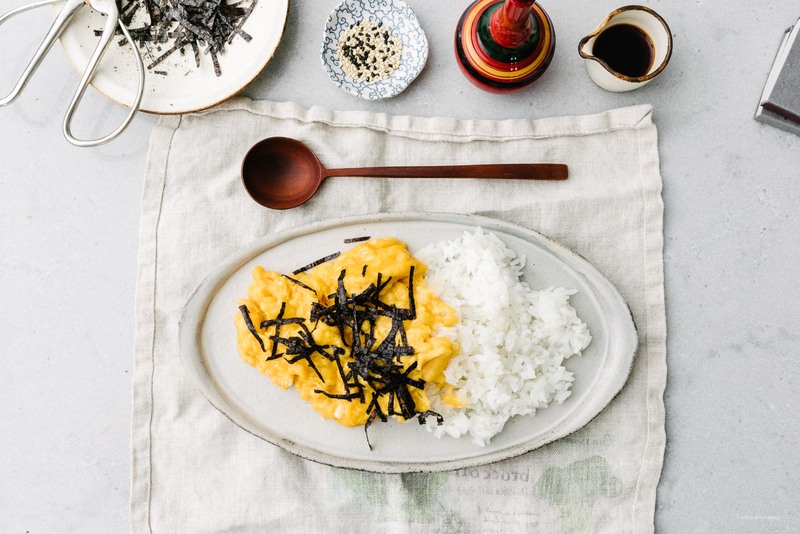 You know, that unassuming little brick of bright yellow rolled omelette on rice, wrapped with a nori belt? 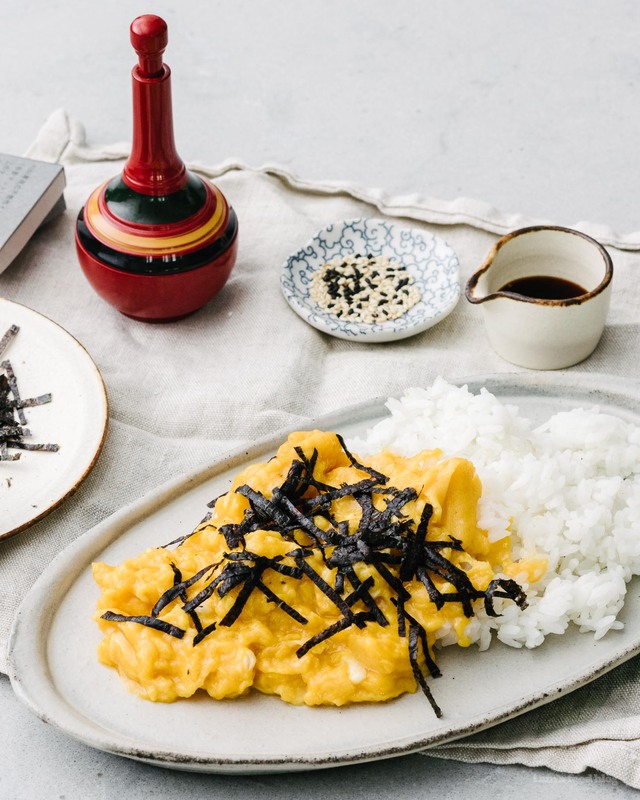 It doesn’t look like much but tamagoyaki – which is literally “egg grill” in Japanese – is an art. If you don’t think so, just watch the tamago making in Jiro Dreams of Sushi – I think the assistant had to make it over two hundred times before it was deemed acceptable. He had tears in his eyes when he mastered it and I know the feeling. I too have had tears in my eyes over tamago: tears of joy when biting into that perfect piece. 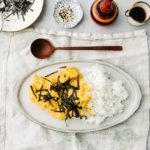 If you haven’t had tamagoyaki before, it tastes a little sweet, a little savory, and basically like how all eggs should taste. If it sounds a little weird that there’s sugar in the eggs, don’t think about it too much. It essentially enhances the savoriness of the egg and soy. Tamago sushi is one of my favorite sushis. I almost always end my sushi order with one. I wish I ate more tamagoyaki, but one can only spend so much time at the stove rolling omelettes. To be honest, I think Mike was starting to get concerned with the time I was devoting to Japanese rolled eggs. 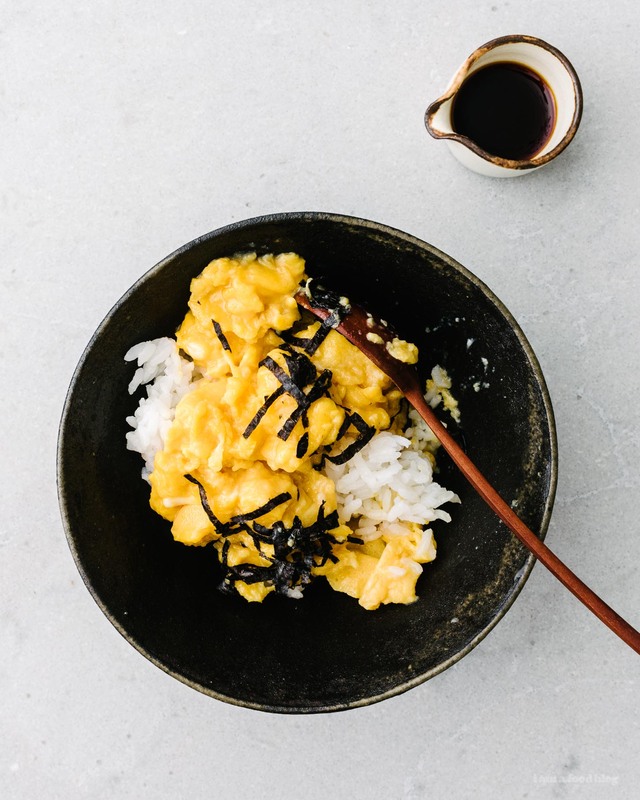 Enter: soft scrambled tamago!! Yes, that needed two exclamation marks because soft scramble tamago is genius. I love soft/slow scrambled eggs. I love tamagoyaki. I love the mutant hybrid of the two. I came across the idea when scrolling through Instagram. Ironically, I was next to the stove waiting for a layer of tamagoyaki to set. The photo was a glorious mess of golden yellow eggs on a bowl of rice. I don’t think I’ve ever clicked a link so fast. The Food52 version has garlic, which has no business being in tamgoyaki so I left it out. It also has decidedly less sugar but if you’re going to go for sugar in your eggs then you should go all in so I just took my usual tamagoyaki mix and soft scrambled it. It was perfect. I know seems indulgent, decadent, and crazy eating a bowl of scrambled eggs with sugar in them, but heck, if this is being a grown up, then I sure am glad I am one. Happy tamago-ing! 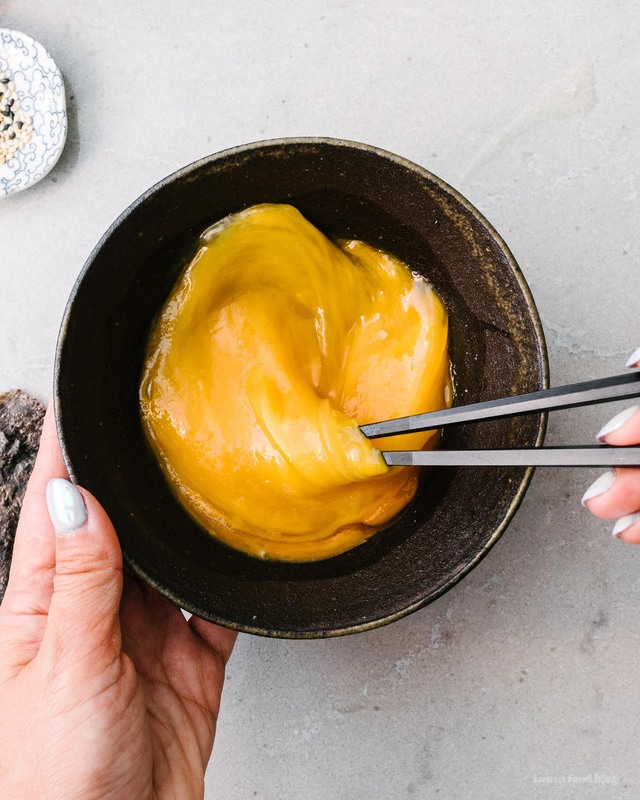 In a small bowl, whisk together the eggs, mirin, sugar, and soy. Add the egg mix, along with the butter to a cold pan. Using a rubber spatula, stir occasionally over medium-high heat so the eggs cook slowly and evenly, pushing only every so often so you end up with large curds, about 2-3 minutes. Undercooked is better as they’ll continue to solidify off the heat. 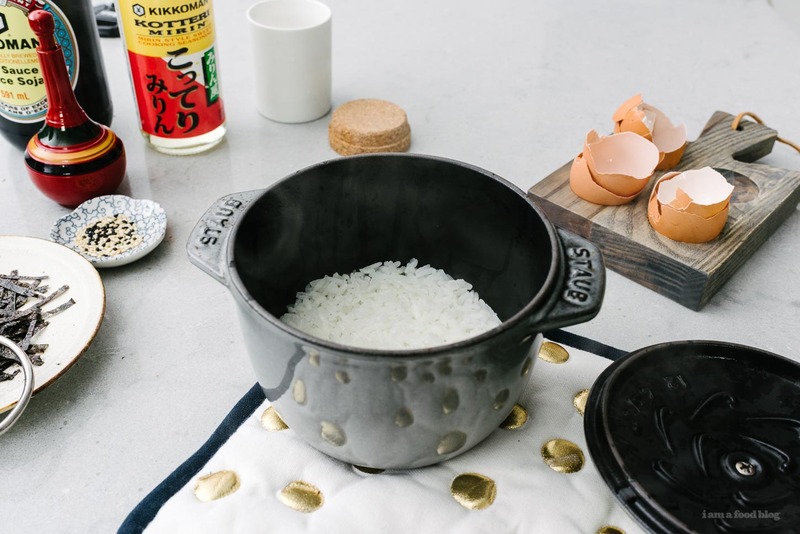 Slide onto a bowl of white rice, season with salt and pepper, and top with nori. Enjoy! So you start the eggs in a cold pan and then cook on how high of heat? They look so good. Can’t wait to try. hi, sorry, i’ll clarify in the recipe! start them in a cold pan and turn the heat to medium high! What a great idea! I’ve never had this before but now I’m very intrigued! I love soft-scrambled eggs, too. Can’t wait to give this a try. Thanks for sharing! hope you give them a try elizabeth! I had some leftover coconut rice in my fridge and just put the eggs on top. 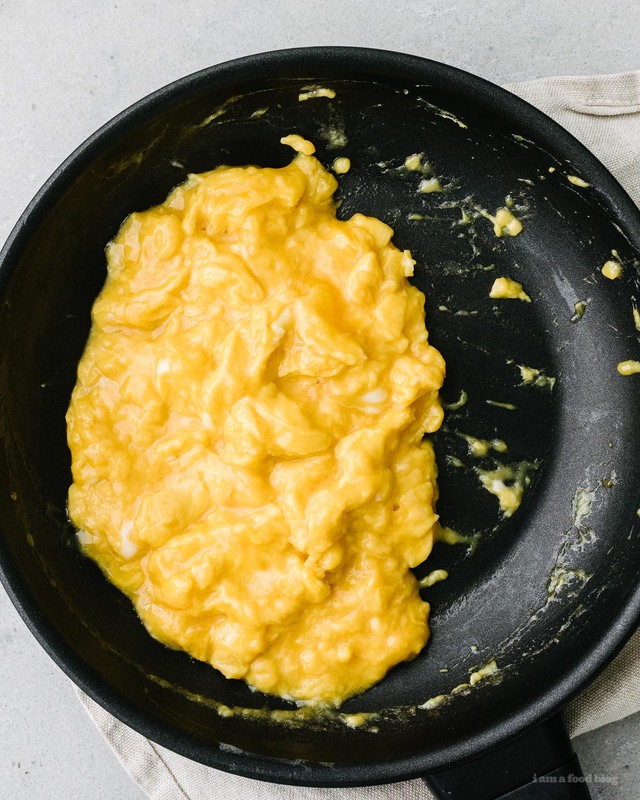 Holy moly, I am never eating plain old scrambled eggs again. Now THIS is how you eat eggs. Love it. This was so good & easy to make! I’ll definitely be doing it over and over again! It looks delicious! I often make soft scrambled eggs on left over rice. I like the idea of adding a little soy sauce and sea weed. I love the chewiness of the seaweed. I just ordered one of those Staub rice cookers! Do you adjust your rice ratios when using it? Or can I use the same water:rice that I’ve used in a normal pot? I just bought that Staub rice cooker! Do you have to adjust normal water to rice ratios when using it? i use the standard 1 cup rice to 1 1/4 cup water!